This is very similar to a Mukden Type overprint as it reads 中華 China, 暫用Temporary Use but with the addition of a surcharge. The large characters make this chop very distinctive. 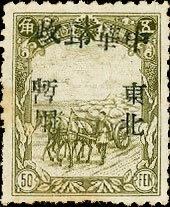 This is a set of one stamps with a Mukden Style overprint reading 中華 China, 暫用Temporary Use in soft violet. Also associated with Ch'ien Chen - Kerr 26. 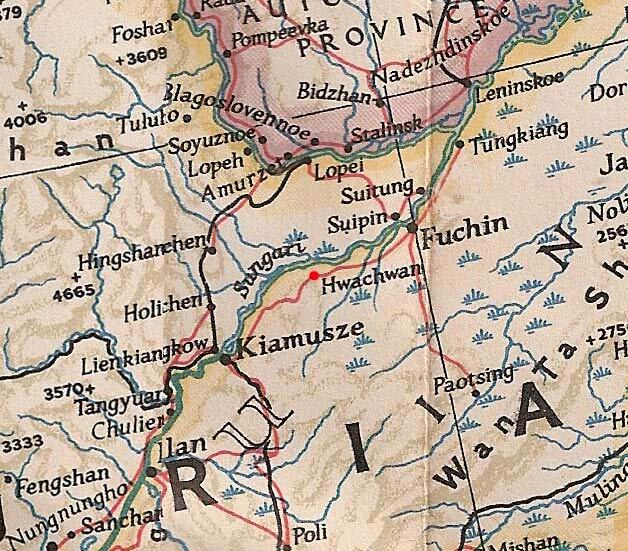 This town is either the next stop on the line or part of Hua Ch'aun itself. 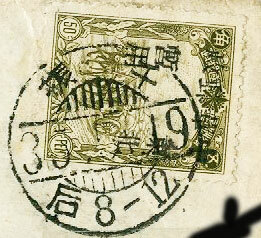 I have seen covers postmarked 千振 and this post office is listed in Fisher. See below. This is a set of 3 values overprinted in oily black ink. The top row reads 中華郵政 Chinese Post and below this 暫用 Temporary Use 北東 North East.